Both Acorn and Walnut Cottage have Free WiFi connections. Enjoy continental breakfasts, aged tawny port and bedside chocolates. With our compliments enjoy a bottle of Barossa/Eden Valley wine on arrival. Relax and enjoy Acorn Cottage in all its seasons. Generous provisions for 2 days cooked and the rest continental breakfasts, sourced from the Barossa Valley where possible, a bottle of quality aged Barossa/Eden Valley wine, plunger coffee and a selection of teas to enjoy with home made slice, aged tawny port, and chocolate fudge on arrival. Fresh flowers and a selection of seasonal herbs. Use of our luxury gowns and mid week service for 6+nights. Relax and enjoy Acorn Cottage in all its seasons. Generous provisions for cooked and continental breakfasts, sourced from the Barossa Valley where possible, a bottle of quality aged Barossa/Eden Valley wine, plunger coffee and a selection of teas to enjoy with home made slice and chocolate fudge, aged tawny port, flowers and a selection of seasonal herbs. Relax and enjoy Acorn Cottage in all its seasons. Includes provisions for continental breakfasts, plunger coffee and a selection of teas to enjoy with home made slice, aged tawny port and home made fudge. Relax and enjoy Acorn Cottage in all its seasons. Includes generous provisions for both cooked and continental breakfast, plunger coffee and a selection of teas to enjoy with home made slice. port, chocolate fudge, flowers and a selection of seasonal herbs. Exclusively yours, includes generous provisons for continental breakfasts, plunger coffee and home made biscuits, port and chocolates. Use of luxury gowns and discount vouchers to selected businesses. Exclusively yours, accommodating 2-4 guests in the beautiful township of Angaston. Walking distance to the main street. Generous provisions for cooked and continental breakfasts, sourced from the Barossa Valley where possible, plunger coffee and a selection of teas to enjoy with home made slice and chocolate fudge, a bottle of Barossa wine, aged tawny port, flowers and a selection of seasonal herbs. Exclusively yours, accommodating 2-4 guests in the beautiful township of Angaston. Walking distance to the main street. Includes provisions for continental breakfasts, plunger coffee and a selection of teas to enjoy with home made slice, aged tawny port and chocolates fudge. Fresh flowers and a selection of seasonal herbs. Exclusively yours, accommodating 2-4 guests in the beautiful township of Angaston. Walking distance to the main street. Generous provisions for cooked and continental breakfasts, sourced from the Barossa Valley where possible, a bottle of quality aged Barossa/Eden Valley wine, plunger coffee and a selection of teas to enjoy with home made slice and chocolate fudge, aged tawny port, flowers and a selection of seasonal herbs. Exclusively yours, accommodating 2-4 guests in the beautiful township of Angaston. Walking distance to the main street. Exclusively yours, accommodating 2-4 guests in the beautiful township of Angaston. Walking distance to the main street. Includes provisions for 2 days cooked and the rest continental breakfasts, plunger coffee and a selection of teas to enjoy with home made slice, a bottle of aged Barossa/Eden Valley wine. aged tawny port and chocolates fudge. Fresh flowers and a selection of seasonal herbs. Complimentary use of our luxury gowns. Mid week service 6+ nights. Exclusively yours, accommodating 2-4 guests in the beautiful township of Angaston. Walking distance to the main street. 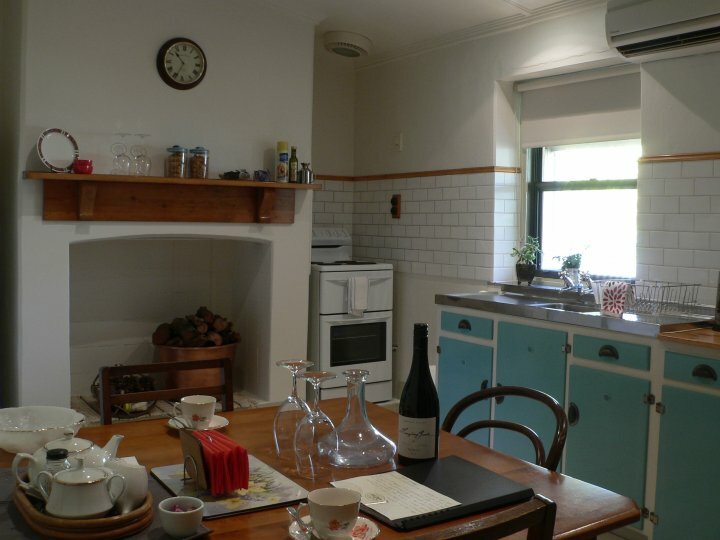 Includes provisions for cooked and continental breakfasts, plunger coffee and a selection of teas to enjoy with home made slice, a bottle of aged Barossa/Eden Valley wine. aged tawny port and chocolates fudge. Fresh flowers and a selection of seasonal herbs. Exclusively yours, includes generous provisions for continental breakfasts, plunger coffee and home made slice, a bottle of wine, port and home made chocolate fudge. Exclusively yours, heritage cottage accommodation in the beautiful township of Angaston. Walking distance to the main street. 2 guests for 3 nights. Includes provisions for continental breakfasts, plunger coffee and home made slice, a bottle of Barossa wine, port and home made chocolate fudge. Check In instructions please call 0419 188 974 at least one hour before arrival, to arrange for Check-In. Children welcome in Acorn Cottage.